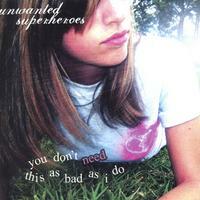 Unwanted Superheroes (also known as USH) was a five-piece emo-core band from Pembroke Pines, Florida. Formed in 2002, Unwanted Superheroes shot up the South Florida music scene in only a flash. Rising up from out of nowhere in the small town of Pembroke Pines, Florida, they went on to share the stage with bands such as Thursday, Coheed and Cambria, Emery, 18 Visions, A Static Lullaby, Brazil, The Beautiful Mistake, Misery Signals, Secret Lives of the Freemasons, Hawthorne Heights, The Fully Down, Rise Against, Alexisonfire, Silverstein, This Day And Age, Remembering Never, The Panic Division, Hopesfall, Burns Out Bright, codeseven, Anatomy of a Ghost, LoveHateHero, The AKA's, The Bensons, The Ombudsmen, Disclaimer 70, Jack Morgan BSc, The Black Maria, Rory, and Madison.